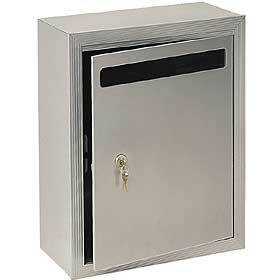 Locking mailboxes are the best way to take the first step in trying to protect your identity. Millions of people become victims of identity theft each year, with many of the crimes being fully preventable. Most Americans receive many pieces of mail each year containing information identity thieves are very interested in getting their hands upon. If they get even one of those pieces of information and use it for criminal activity, you could be facing years of difficulty trying to regain your identity, clear up credit score mistakes and deal with debt you never personally acquired. Taking action today to protect your identity can save you a great deal of stress and money in the future. If you are looking for a secure mailbox, you will find an entire line manufactured by Salsbury Industries. Many of the Salsbury mailboxes either come with locks already installed or with optional locks. This makes them quite secure for the average home or business owner. In addition, with Salsbury you will find a complete line of mail drops and receptacles you can install on the door to your home or business. Choosing a mailbox today is not as simple as you used to be. It is not just a matter of choosing something approved by the postal service or one which looks stylish. Today’s mailbox shopper must keep security in mind and make certain they shop for mailboxes or mail drops and receptacles which will substantially reduce any chance for identity theft. Salsbury mailboxes are one of the manufacturers with which you can feel confident of finding not only a stylist receptacle for your mail but also enhanced security for your protection.